Algonquin Hotel bartender Hoy Wong turns 90 today. He's been bartending for 58 years, never misses a day of work—shows up early when the weather's bad—and has made drinks for celebrities like Marilyn Monroe, Judy Garland ("Very sad. She always had a cocktail glass in her hand.") and Dean Martin. Many happy returns of the day, Mr Wong! kiplog reviews Nobu 57's Omakase, with photos. The good: "Every dish was perfection." The bad: " But if I'm going to pay a hundred dollars for a meal, a dish should NEVER arrive before I'm done with the one I'm eating. And it happened with every course, a staff member either holding my next plate in full, impatient view, feet away, or rushing in to get me to move my current dish aside." Poor service will leave a bad taste in your mouth after the best of meals. Everyone hates Midtown, even (especially?) the people that live and work there, although Burger Joint is one of the few reasons to ever visit voluntarily. The Shake Shack is in the Flatiron District, and easily reachable by subway. The Shake Shack has more seats and is in a pretty enough park, but the Burger Joint booths are cozily dingy, and I appreciate how weird it is to have such a place right off the extremely austere Parker Meridien lobby. I'd bring a date or tourists to Burger Joint; I'd bring a group of friends to Shake Shack. There are days in the spring and the fall when it's too cold or too wet to go to Shake Shack, and many days in the summer when all you want to do in the extreme heat or humidity is eat in a really cold room. And then, you know, there's that whole thing of the Shake Shack not being around at all in the winter. You can drink beer indoors at Burger Joint or outdoors at Shake Shack, depends on what sort of environment you prefer. 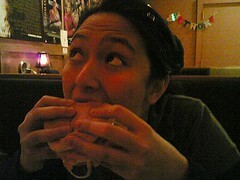 It's easier to BYOB at Shake Shack or to stagger to a neighborhood bar for harder liquor when you're done eating. The Burger Joint's milkshakes are tasty enough but their brownies are nasty, whereas the Shake Shack has more than a dozen delicious custards and concretes so you can polish your meal off properly. Shake Shack's fries are good (especially with cheese! but that's true of most everything), Burger Joint's are okay but clearly an afterthought. Burger Joint lines are much shorter, but Shake Shack service far more pleasant. I like the Shake Shack burger a lot and I appreciate the customizability very much, but for my money, the Burger Joint burger is far juicier. The Shake Shack has clearly got a lot going for it, I tend to eat there thrice as often, and is clearly the better restaurant overall, but when asked where the best burger in Manhattan* is, my reply will always be: Burger Joint. It's not a close call at all. Agree? Disagree? As always, drop me an email or let me know in the comments! Subway: F to 57th St.
*Want the best burger in all of New York City? Well, you'll have to go to Peter Luger in Brooklyn for that. Well worth the trip! NYC Soup Man Al Yegeneh (a.k.a. Seinfeld's Soup Nazi) is opening a store—but on 42nd and Madison instead of his old location on West 55th, which according to his site he's looking to lease out until 2019. Also: he's changed store names on us, from Soup Kitchen International to Soup Man, to capitalize on his fame and tie in with his upcoming heat-n-serve soup line, which should be in groceries this month. Anyone seen or tried the soups? Let us know! NYC One of the questions I hate getting asked that pops up most frequently is "Where's a good place to eat in Midtown?" Citysearch has a Midtown Dining roundup, sure, but am I wrong to be somewhat dubious of a roundup that a) only lists places for special occasions or cheap eats and b) doesn't mention Grand Sichuan International Midtown in either category? Mix: Fun and cool, or lost in translation? Two months since its opening, Mix continues to elicit a mixed reaction from food critics, primarily in terms of the dining experience. Last week William Grimes wrote of Mix, "Someone needs to tell Mr. Ducasse that Americans, even if they do watch a lot of television and have short attention spans, do not need to be distracted every second that they are in a restaurant. Mix is fun, but a little less fun might work just as well." Adam Platt of New York Magazine writes: "Of course, Monsieur Ducasse’s version of a good-old fashioned meal is different from yours and mine. Mix may be a spin-off, but being a Ducasse restaurant, it has nothing casual about it. The tone of the place. . . is elaborately, even purposely confused. It’s a mad jumble of transatlantic styles and intentions, an entire restaurant lost in translation." and ". . . some of the dishes have a stilted, off-key quality." Certain places flagrantly take customers to the cleaners. Two weeks ago, I called out new Alain Ducasse-backed Mix over its obscene prices, which much of the foodie press seems determined to deny. The Times reported Mix's pre-fixe dinner options as $48 or $58. It unfathomably chose not to mention the $72 option - the only one that includes a real entr‚e, and the one most diners will want. The new Zagat Survey ranks Mix as "E" for expensive. In the zany world of Zagat, "E" means $31-$50 for dinner per head with one drink and a tip. At Mix, $31 will cover a glass of wine plus tax and tip, leaving maybe $4 for food. Eat up! Pretending prices don't matter is unfair both to customers and restaurants. We decided to pay a visit to the recently opened Minado tonight. Though I had read the reviews, it was not enough to prepare me for the scale of the restaurant, one more appropriate to Las Vegas than midtown Manhattan -- a seemingly endless buffet and an airy dining room large enough to seat 500. The seafood is fresh and plentiful, and service friendly and attentive. Obviously not the best sushi available in the city, but it's also far from the worst. Minado is definitely worth experiencing at least once.